Ford kicks off new $600M engine program in Windsor, Ont. 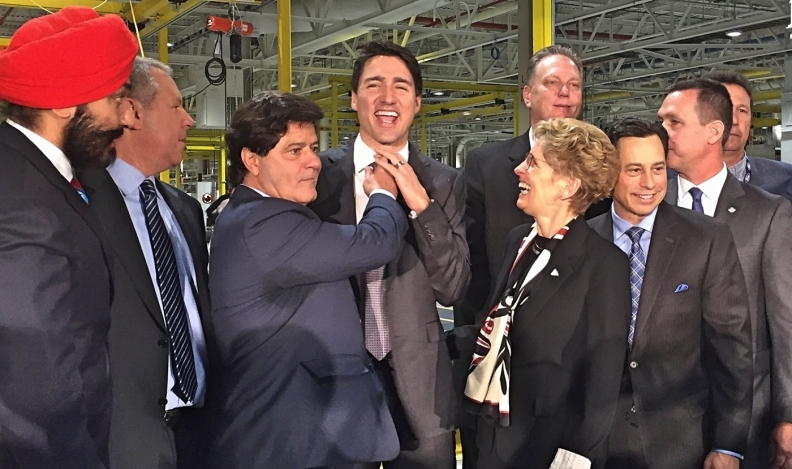 Unifor President Jerry Dias plays with Prime Minister Justin Trudeau's tie as the two, along with Ford executives and other politicians, celebrate the automaker's investments in Canada. WINDSOR, Ont. -- Ford Motor Co. plans to add output of a new engine at its Windsor, Ont., plant as part of a $600-million investment that will boost Canada's auto industry after years of job losses to Mexico and the United States. Two sources familiar with the matter told Reuters the 7X engine, for large pickup trucks, will be built at Ford’s Essex Engine Plant in Windsor. However, neither Joe Hinrichs, Ford's president of the Americas, or Mark Buzzell, CEO of Ford of Canada, would comment on the engine Thursday. “All we’ve said is that it’s going to be a global engine and we’re going to have all kinds of flexible equipment, but we’re not saying anything about the engine, yet,” Hinrichs said. “We’re not talking about jobs, yet, either. Hinrichs said retooling will cover the Essex Engine Plant and Windsor Engine Plant next door, adding the work will start soon. Equipment is already on the shop floor and preparation has begun, he said. Brian Maxim, a vice president at AutoForecast Solutions, said in a telephone interview that the 7.0-litre, V8 engine would have more torque and be more fuel efficient than the 6.8-litre V10 engine now built in Windsor and used in Ford's super-duty trucks, such as the F-250. The investment in a new engine production line in Canada is seen as vital because the large V8 and V10 motors now built by Ford in Windsor were expected to end production in four years. The new engine is expected to help Ford meet stringent emissions and fuel-economy requirements in North America. During 2016 contract negotiations with Canadian union Unifor, Ford pledged to spend $700 million on its Ontario manufacturing operations. Hinrichs said Thursday that $600 million will be spent on the engine program in Windsor and $100 million will be spent at the Oakville Assembly Plant. “It’s a great day for Canada. This is about the decades to come,” Unifor President Jerry Dias said. “What we did in 2016 ensures the future is bright. Canada understands what it takes to create jobs. Unifor Local 200 President Chris Taylor was emotional while addressing members and dignitaries Thursday at the Essex plant. In a separate announcement made on the same stage, Hinrichs said Ford is spending $500 million to add more than 300 engineers and create a research and engineering centre in Ottawa, to enhance connected vehicle technology. Ford’s various investments in Ontario disclosed today will be supported by $102 million from the province and an additional $102 million from the federal government. Between 2001 and 2013, some 14,300 jobs were lost in vehicle manufacturing in Canada, according to Hamilton's Automotive Policy Research Centre.